The U.S. Coast Guard has developed rules applicable to both U.S. and foreign-flag vessels that require owners and operators of most commercial vessels to install and use the AIS. The AIS rule is part of domestic and international effort to increase the security and safety of maritime transportation. AIS Regulations became effective November 21, 2003. Dynamic Information—Time in universal time, coordinated, latitude/longitude position, course over ground, speed over ground, heading, rate of turn, navigational status. In addition, shore stations will be able to relay pertinent navigational data from other sources, such as the National Oceanic and Atmospheric Administration’s Physical Oceanographic Real Time System (PORTS) and U.S. Coast Guard Vessel Traffic Centers. The advantage of an automatic and continuous exchange of information is that all can access it and since it is digital data, software can be modified to the mariner’s requirements by the manufacturer thus reducing the need for voice radio exchanges. Also, the AIS enhances the mariner’s situational awareness, permits more effective and reliable passing arrangements, and provides the Coast Guard with a comprehensive and informative traffic image and maritime domain awareness not possible with radar or video surveillance alone. 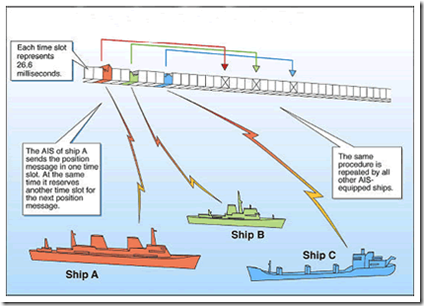 The AIS which operates in the VHF maritime band, works as a shipboard broadcast system that acts like a transponder. AIS is capable of handling more than 4,500 reports per minute and updates almost every two seconds. AIS meet this high broadcast rate by using Self-Organizing Time Division Multiple Access (SOTDMA) technology to ensure reliable ship to ship and ship to shore operation. The information is continually updated in near real-time and received by all AIS-equipped ships and shore stations in its vicinity. digital VHF radio communication equipment that permit the voiceless exchange of navigation information between vessels and shore based vessel traffic centers. 2.How Does it Work ? standard marine electronic communications links (IEC 61162/NMEA 0183) to shipboard display and sensor systems. Position and timing information is normally derived from an integral or external global navigation satellite system (e.g. GPS) receiver, including a medium frequency differential GNSS receiver for precise position in coastal and inland waters. Other information broadcast by the AIS, if available, is electronically obtained from shipboard equipment through standard marine data connections. Heading information and course and speed over ground would normally be provided by all AIS-equipped ships. Other information, such as rate of turn, angle of heel, pitch and roll, and destination and ETA could also be provided. The AIS transponder normally works in an autonomous and continuous mode, regardless of whether it is operating in the open seas or coastal or inland areas. Transmissions use 9.6 kb GMSK FM modulation over 25 or 12.5 kHz channels using HDLC packet protocols. Although only one radio channel is necessary, each station transmits and receives over two radio channels to avoid interference problems, and to allow channels to be shifted without communications loss from other ships. The system provides for automatic contention resolution between itself and other stations, and communications integrity is maintained even in overload situations. Each station determines its own transmission schedule (slot), based upon data link traffic history and knowledge of future actions by other stations. A position report from one AIS station fits into one of 2250 time slots established every 60 seconds. AIS stations continuously synchronize themselves to each other, to avoid overlap of slot transmissions. Slot selection by an AIS station is randomized within a defined interval, and tagged with a random timeout of between 0 and 8 frames. When a station changes its slot assignment, it pre-announces both the new location and the timeout for that location. In this way new stations, including those stations which suddenly come within radio range close to other vessels, will always be received by those vessels. The required ship reporting capacity according to the IMO performance standard amounts to a minimum of 2000 time slots per minute, though the system provides 4500 time slots per minute. The SOTDMA broadcast mode allows the system to be overloaded by 400 to 500% through sharing of slots, and still provide nearly 100% throughput for ships closer than 8 to 10 NM to each other in a ship to ship mode. In the event of system overload, only targets further away will be subject to drop-out, in order to give preference to nearer targets that are a primary concern to ship operators. In practice, the capacity of the system is nearly unlimited, allowing for a great number of ships to be accommodated at the same time. The system coverage range is similar to other VHF applications, essentially depending on the height of the antenna. Its propagation is slightly better than that of radar, due to the longer wavelength, so it’s possible to “see” around bends and behind islands if the land masses are not too high. A typical value to be expected at sea is nominally 20 nautical miles. With the help of repeater stations, the coverage for both ship and VTS stations can be improved considerably. The system is backwards compatible with digital selective calling systems, allowing shore-based GMDSS systems to inexpensively establish AIS operating channels and identify and track AIS-equipped vessels, and is intended to fully replace existing DSC-based transponder systems. Class A: Shipborne mobile equipment intended for vessels meeting the requirements of IMO AIS carriage requirement, and is described above. Class B devices are not yet available. Search and Rescue Aircraft: Aircraft mobile equipment, normally reporting every ten seconds. Aids to Navigation: Shore-based station providing location of an aid to navigation. Normally reports every three minutes. This may eventually replace the racon. AIS base station: Shore-based station providing text messages, time synchronization, meteorological or hydrological information, navigation information, or position of other vessels. Normally reports every ten seconds. OldSailor feels AIS helps to identify ships nearby without any need for voice communication.